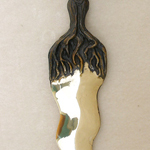 A beautiful solid bronze dagger, the handle is the image of the tree of life, the earth mother. The roots reach down the blade and her arms and hair reach up to become the growing branches. The trunk of the tree is a rich brown and the leaves are green, the blade is polished bronze.